For the celebrating four teams, those precious moments before Gary Watkins – Autosport journalist – begins the first post-race press conference of the FIA World Endurance Championship are full of feverish chatter. 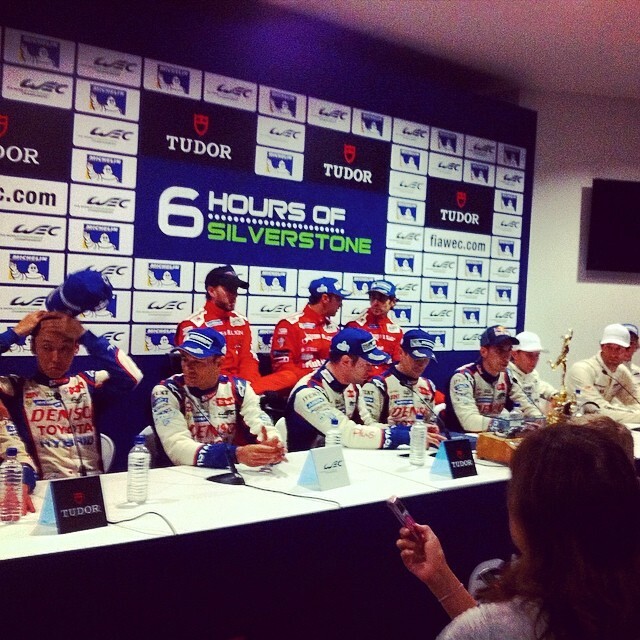 Sitting centre is Toyota’s Anthony Davidson – he, with his team mates Sebastien Buemi and Nicolas Lapierre are now proud recipients of the RAC Tourist Trophy following their triumph in the ‘Silverstone 6 Hours’. …or the ‘Silverstone 5 hours, 23 minutes’ if you so wish. The rain certainly held its sway on a dreary and cold Easter Sunday. Despite the effort, the Briton appears relatively fresh, although his appearance was no doubt bolstered by lingering traces of adrenaline, as he sizes up the tangible rewards before him. Points will also be on Davidson’s mind. Toyota dominated this event, whereas Audi stumbled – neither finished – while Porsche, 3rd in this instance, may still have some way to go before they can truly press for winners honours. As the nine tabled drivers (Toyota’s Alexander Wurz is just out of shot) purge information from the day’s events, as details fill once gap-studded stories, giving life to the tales soon unfolded. Sitting behind the manufacturer drivers are the three pilots of the privateer Rebellion Lola – Nick Heidfeld, Nico Prost and Mathias Beche. A good effort again by the Swiss squad, but they are some long distance away from the monied entrants and, to be fair, the competition in the P2 category was a touch thin. The 6 Hours of Spa-Francorchamps is next. Coming this weekend, it represents one of the final times the manufacturers and privateers alike can get in some competitive mileage before the monstrous Le Mans in June. With respectable weather expected, it will also give an indication as to whether Toyota truly do hold a good hand and will tell more about the capabilities of the Audi and Porsche hybrids.